Nestled along the Potomac River in Smoots Bay, National Harbor Marina is the premier marina in the Chesapeake Bay region. Featuring all the amenities of a waterfront resort in addition to the facilities and professional staff, National Harbor Marina, managed by Oasis Marinas focuses on providing only the highest quality of service to our clients. Whether you are a permanent boating resident or here on a transient basis, you will benefit from the centralized address when it comes to traveling by water or land. Moments away from dozens of historic sites such as Georgetown, Mt. Vernon or Old Town Alexandria, and offering a world of dining and entertainment venues for our boaters, National Harbor Marina is not just a place to dock your boat, but a destination to be discovered. Please inquire with the Marina Office for annual rates. 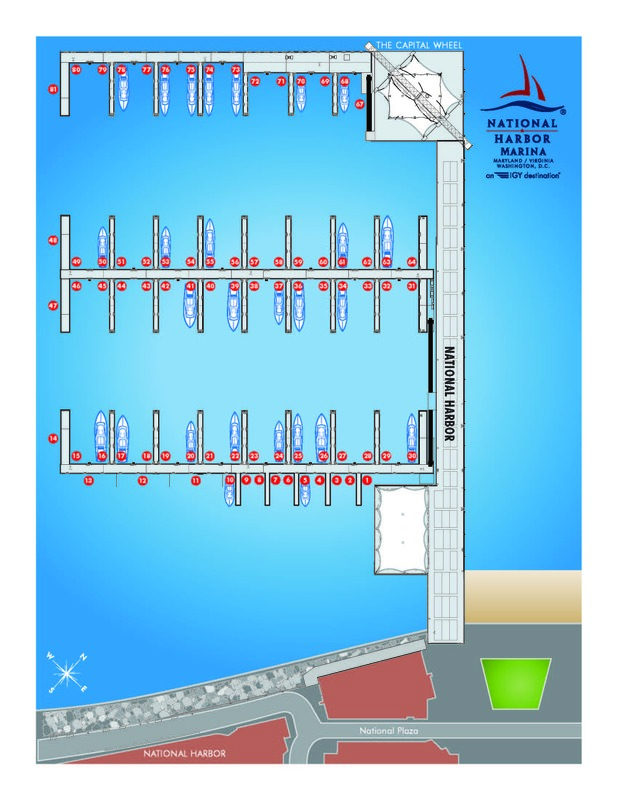 HOURLY DOCKAGE POLICY: Docking is prohibited without permission from marina staff. Dock at your own risk. National Harbor Marina is not responsible for any damage or theft of property from your vessel. Dockage is given on a first-come, first-serve basis. No reservations are accepted for hourly dockage. Last call for docking is two (2) hours before closing. Marina staff reserves the right to refuse dockage to anyone. Marina Office – 9 to 5 Monday – Saturday. Fuel Dock: By Appointment Only. Please call (301) 749-1582 to schedule fueling.